The app has many reasons why you should get it! In this review we want to outline the reasons why we at team member of Catch and Release think this is the best fishing app on the ITunes app store. The app has many useful features that you can easily navigate to from the home page. As you can see from the picture of the home page there are many options you can choose from. The member deals is a great place to start they have many deals on bait, clothing, tackle and much more. The next option down is “fishing Uk Social” this is where you can check out the forums for many different subjects relating to the sport fishing. A new option has been added in the latest update the “goggle box” this takes you to a list of many TV channels created by many different fishing companies and blog sites. You can find Catch and Release Tv on this list we have some great video blogs on here from members of Team catch and release, also videos from our associated anglers. The tackle box is a brilliant area to check out techniques for tying knots, rigs and much more. There is a step by step guide on every rig that you will need to tie for every situation. These steps are clearly written and are accompanied by simple diagrams for you to follow. Another link you can go onto in the tackle box is the“SPECIES” this is a fantastic area where you can learn about the species of fish you are trying to catch. We at catch and release believe if you appreciate and learn more about the species of fish (in our case carp) you will be more successful in learning the habits of the fish in your lakes you fish. The tackle box area is great because not only does is cater for the experienced fisherman it also is a fantastic area to read if you are just starting fishing and looking for precise tips that do not confuse you from the start. The final option is find a Venue/Shop this is very handy to search new lakes in your area or even if you are going away somewhere in the UK. People have reviewed and pictures on the lakes they have been fishing it is always worth a look to see if there are any tips or methods suggested for the lake you are fishing. We at Team Catch and Release think this certainly the best Application too have with you at home, bankside and even on holiday when you are looking for a quick days fishing. What is fantastic is that we as anglers can have our own input on the app adding pictures and reviews. The application can only grow in size and we are looking forward to seeing it get even more popular than it already is. Fishing UK offers you the opportunity to search 2900+ UK fishing venues, including fisheries, lakes, ponds and rivers, and 900+ UK tackle shops at the touch of a button using our impressive multiple search functions. 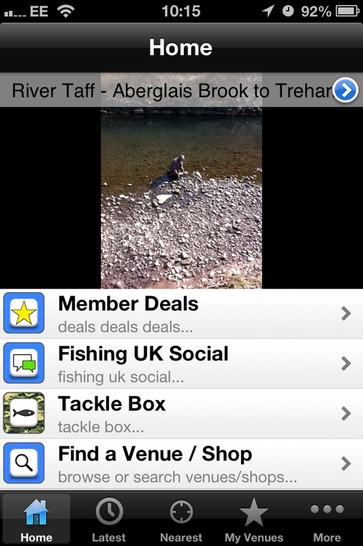 Rate and review your favourite spot and chat with 1000s of UK anglers in the app forum. Save money in the member's deals section and why not show the country your latest catch photo! The Fishing UK Team offers a total fishing experience with tutorials and information on a variety of angling methods. Read about leads, rigs, floats or feeders. We have it all!